I want to wait until I have all the pictures, before I do a post on my little Reese's awesome 1st birthday party. But I've already posted some of the pictures on facebook and on our family blog and I've been flooded with messages and phone calls from friends and family, wanting to know how I made the rainbow cupcakes. Click HERE for a video demonstration on the technique. The recipe I used for the white cake base is below. This recipe makes the most delicious and moist cupcakes ever! See recipe below. 2. In a large bowl combine the cream cheese, egg whites and vegetable oil. Using a hand mixer, beat the ingredients until combined and creamy. 3. Add the cake mix, water and vanilla and mix until smooth, about 3 minutes. 4. Fill the muffin cups to just below the rim and bake until puffed and golden, about 18 to 20 minutes. 6. When cook, frost with vanilla butter cream frosting (recipe below) or your favorite frosting. 1. In a mixing bowl combine the butter, vanilla and powdered sugar. Mix, starting slow, until somewhat combined. 2. Start by adding 1/4 C. milk and mix. Slowly add more milk, one or two tablespoons at a time, until the frosting reaches your desired consistency*. 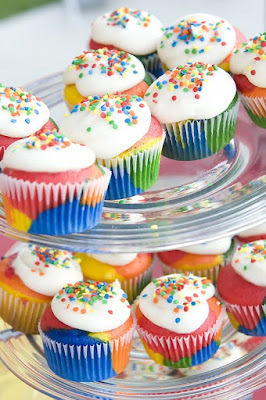 *For cupcakes and cake you want the frosting to be a little thicker, so it holds it's shape. If you are using the frosting cookies, Cinnamon rolls etc...you may want the frosting a little thinner. So, what was your frosting recipe for these (and the bigger cake)? The frosting looks yummy! And what is your white cake mix recipe? I like the way yours look even better!!! Do you happen to know if I need to make a high altitude adjustment? Linda, I wish I knew more about altitude and how to adjust, but unfortunately I don't. I'm not sure where you live or how high :) But I'm in Utah so we are at a higher altitude, so the directions should be ok if you're anywhere near Utah. Good luck! I wish I could be more helpful! When I made them they were super yummy!!! I did have a problem with mine shrinking up from the bottom and the paper wrapper practically falling off of them. I Followed the instructions... Do you have any suggestions?? Sorry it's taken me a while to get back to you. I've been trying to do some research and figure out what could have gone wrong. I've never had that happen, so I asked a couple of my other "baking" friends if they had any suggestions. One of my friends wondered if maybe you sprayed the liners with cooking spray? If so, you shouldn't. Also, maybe you over under mixed the batter, or if the cream cheese wasn't soft enough. You definitely want the cream cheese to be soft like butter. Other than that we couldn't think of anything. I hope that helps. Let me know if you have any other questions. Good luck! Thank you for your suggestions! I did not spray my liners but i will try maybe letting my cream cheese get a little softer first and mixing it all together better.. My batter also looked runnier than yours did on studio 5.. I don't know if that had anything to do with it. I will keep trying! They were a big hit with my family members!!!! I wonder if it had anything to do with the brand of white cake mix you used? Just a thought. I always use Betty Crocker or Dunkan Hines. The batter should definitely not be runny. It should have the consistancy of a muffin batter. I wish I had more suggestions. Maybe try it again and see what happens. I've used this recipe for years and it turns out the same every time. I bet it's something so simple. Just had to tell you that I made these cupcakes this weekend, (I'm not much of a cake/cupcake person and even refuse a usual birthday cake for a pie.) But I love to decorate and wanted to take something special to a few people. So I figured I'd try this recipe. My husband said these are the best ever, and I've not been able to stop eating them myself. What a great recipe!! Well this recipe work for a 13"x9" cake pan?? I want to make it for my son's birthday cake since I'll be using a box cake mix but was wondering if it would work?? His party is on Saturday, May 22nd. Jared, Beth, Carter and Maylee, Yes this would for for 9x13. I would just dollop the colors all over. Don't mix them, even if the batter looks uneven. It will even out as it bakes. Good luck! I have done it like that multiple times and it works great!!!!!!! BTW, the cupcakes turned out adorable! I made them orange, green and blue...frosted them...and then made marshmellow lego man head toppers- my boy LOVED them. I just finished making your rainbow cake for the kids Kindergarten class who will be celebrating fasching tomorrow! Thanks! I am sure it'll be a hit.